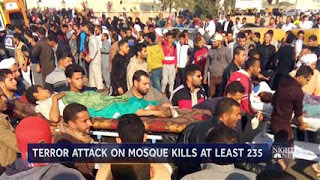 Home / Uncategories / Terror Attack On Egypt Mosque Claims At Least 235 Worshippers. 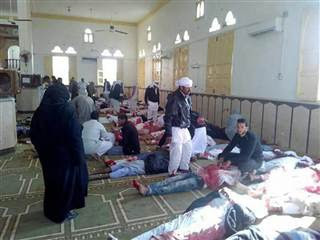 Terror Attack On Egypt Mosque Claims At Least 235 Worshippers. 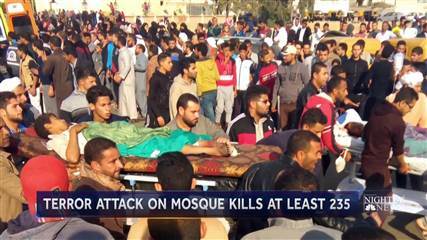 Islamist militants attacked a crowded mosque in Egypt Friday, killing at least 235 people and wounding 125 so far, according to state media. Gunfire and the explosions of bombs ripped through the Sufi al-Rawdah mosque on Egypt’s Sinai Peninsula, 125 miles northeast of Cairo. An Egyptian military official said a single suicide bomber participated in the attack. A senior government official told state television, “the attackers lingered at the scene even as emergency workers arrived to treat the injured, and opened fire on several ambulances,” according to the New York Times. While there was no immediate claim of responsibility, the country has battled with an ISIS affiliate based in the Sinai Peninsula, which has launched attacks in the country, usually on Coptic Christian churches. “The insurgency gathered momentum after a military coup in 2013 that ousted Mohamed Morsi, Egypt’s first democratically elected president and a leader of the Islamist Muslim Brotherhood,” according to the Washington Post. “The worshipers at the mosque were Sufi Muslims, who practice a mystical form of Islam that some orthodox Muslims and Sunni extremists consider heretical,” the Post reports. “The Islamic State had threatened and killed a number of Sufis in Bir al-Abd in recent months, but the group never targeted a place of worship, the cleric said.”.